Why does something on TV look super terrifying when you’re 8 years old, but totally fake when you re-watch 10 years later? Oh right—you grow up. Now, you know that warlock Kalabar in Halloweentown is just an actor wearing a costume, and is probably totally nice in real life. But as a kid, Kalabar’s monster form is terrifying and traumatizing as hell—though he still looks kinda creepy, not gonna lie. In honor of Halloween, it’s time to face your fears and deal with your (Disney Channel) demons head-on. Relive these “scary” moments below. Maybe it’s just me (it’s not), but this dude is probably the reason I *hate* masks. It was super creepy and unnerving whenever the phantom would pop out of nowhere and never actually say anything. After Kalabar got his warlock hands on Aggie Cromwell’s friend, Harriet went from a sweet lady to a freaky demon-like entity. The snarl she gave also didn’t help ease the tension. 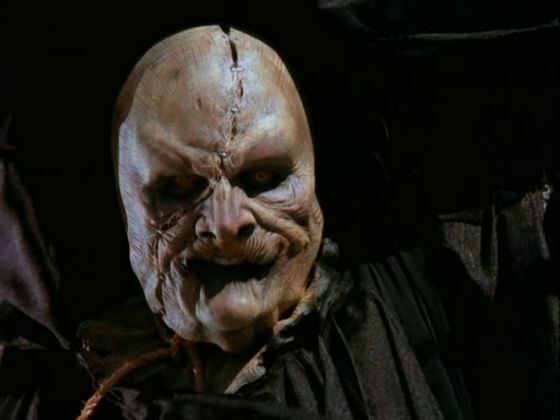 Before we knew this thing was actually Kalabar (Robin Thomas), Voldemort’s look-a-like was a terrifying shrouded figure who kidnapped members of Halloweentown, either turning them into statues, or evil versions of themselves—like what happened with Harriet. 4. When all hell broke loose, thanks to the creature spell, in Halloweentown II: Kalabar’s Revenge. Again with the eerie masks, Disney. Seriously, when Gwen Cromwell Piper (Judith Hoag) turned into an evil goblin thing, all of America dashed underneath the covers. 5. When Cassie (Eliana Reyes) was kidnapped by someone hiding in knight’s armour in Halloweentown High. The audience knew homegirl Cassie was a goner, but she didn’t until it was too late. What’s really messed up was she was supposed to be in a safe room, but you can imagine how well that turned out. Poor Tom Virtue met his end during the opening scene of the “first” DCOM. Thankfully, it was just a movie within a movie the main kids were watching at the theater. First off, Zachariah Kull was scary as hell—until you learned he was grossly misunderstood. But when Claire took a nosedive into the abyss, the trapped souls started popping out and begging, “Help me, Claire,” over and over again. In retrospect, we should’ve been rooting for vampire Dimitri Denatos (Charles Shaughnessy)—instead of the Hansen family—but when we first saw this in 2000, watching a kid nearly become a vampire was a pretty traumatizing moment. Of course, poor Karsh (Pat Kelly) was swallowed up as well, but Illeana’s demise was just darker (heh). Seriously, the Darkness didn’t come to play games. “He” had hands reaching out to steal your soul and dignity. Besides having a super deep and menacing voice, this bro’s tongue could shoot out just like a frog’s. Oh, and he also wanted to kidnap a bunch of children and imprison them in a intergalactic zoo. We noticed, Disney. Nothing against Sara Paxton, but Kimberly J. Brown will always be Marnie. The scariest DCOM featured boogeymen running around and attacking people. The film also included kids getting pulled under the bed by their dangling feet (nope) and dolls that moved on their own (double nope). Oh, and there was a subplot involving a child terrified his cancer would return, so it was just all kinds of WTF.